is a popular open format that is widely used all over the world to publish contact information in a structured form. hCard is based on standard elements of (X)HTML. The concept of hCard is very simple: you mark up the data already residing on your site in a special way so that it can be understood not only by people, but by search robots as well. The official specification for hCard format is published at http://microformats.org/wiki/hcard. You can use hCard to inform Yandex about the address, telephone number and other information about your organization simply by publishing an hCard on your site. By publishing a text marked up in hCard format, you make the data available not only to Yandex but also to other applications that collect data on the web. hCard markup is processed at the same time when your site is indexed by the Yandex search robot. 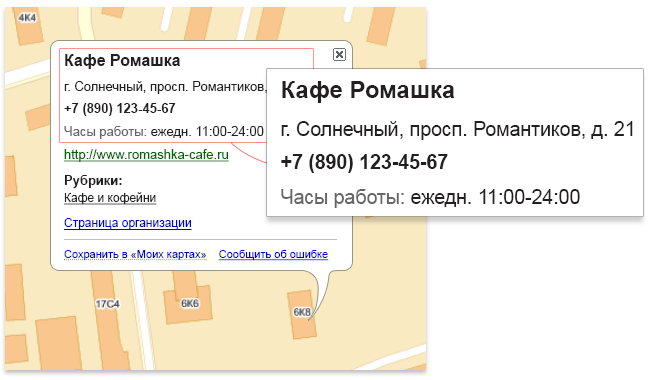 Extracted address data is added to and displayed in various Yandex services. On the search results page under the site description. On the map when searching for an organization. The data is checked for accuracy. The data isn't included in Yandex.Directory if the organization doesn't exist or if you provided a wrong address. When added to the registry, the organization is assigned one or more categories depending on the scope of its activities. The contact information is always tied to the official site of the company and is displayed only alongside the site. Publishing information marked up in hCard on your site doesn't guarantee that the information will be added to Yandex.Directory or another Yandex service. Yandex reserves the right, at its sole discretion, to utilize or not utilize the hCard markup information or any part of it with any of its services, either separately or jointly with information obtained from other sources. Cards are processed only for four countries: Russia, Ukraine, Belarus, and Kazakhstan. Read more about hCard elements handled by Yandex.